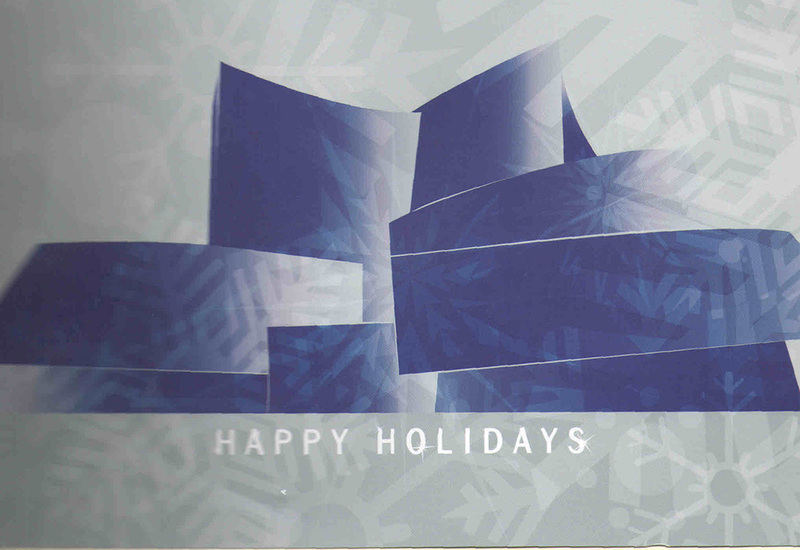 The initial inspiration for this piece was a Christmas card sent by the Los Angeles Philharmonic Association which featured a monochromatic rendering of the Walt Disney Concert Hall, one of downtown Los Angeles’ most distinctive buildings. I am a member of the Speakers’ Bureau and have made a number of presentations to civic groups and schools about the building and orchestra. The concert hall, which was designed by Frank Gehry, opened in October 2003. 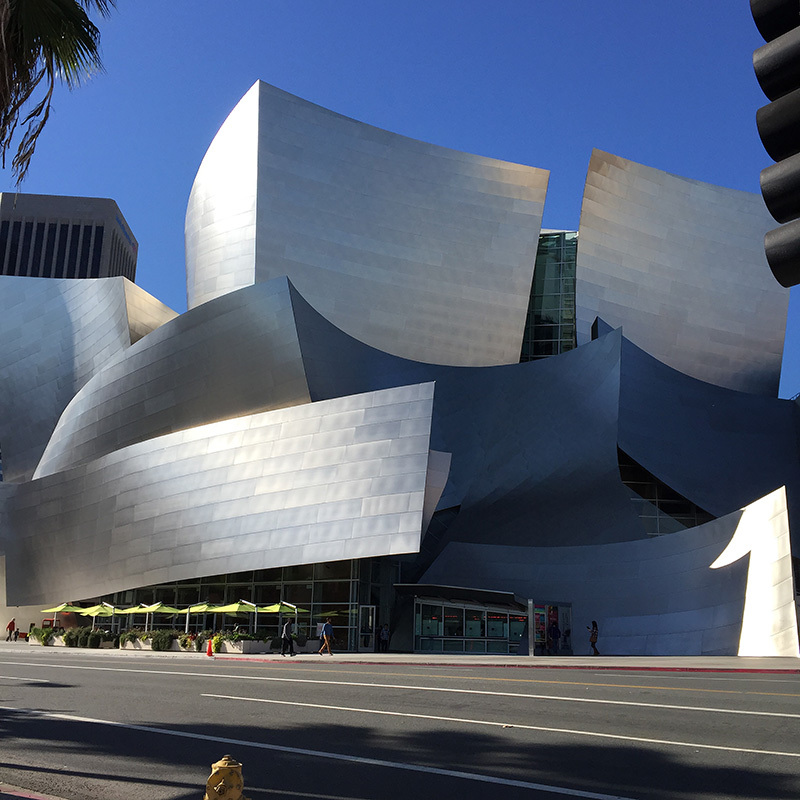 It is the home of the Los Angeles Philharmonic Orchestra. The building is clad in stainless steel. Initially all of the steel was shiny, but nearby residents complained that it reflected too much light, so some of the shine was buffed out of the steel, which has given different sections of the façade different tones. While the card was the “spark” which initiated the design, I wanted to work from my own photograph, so I took a number of photographs of the building from slightly different angles. I then used Adobe Photoshop to get a grey scale rendition of the building to help determine where different shades of grey should be placed. 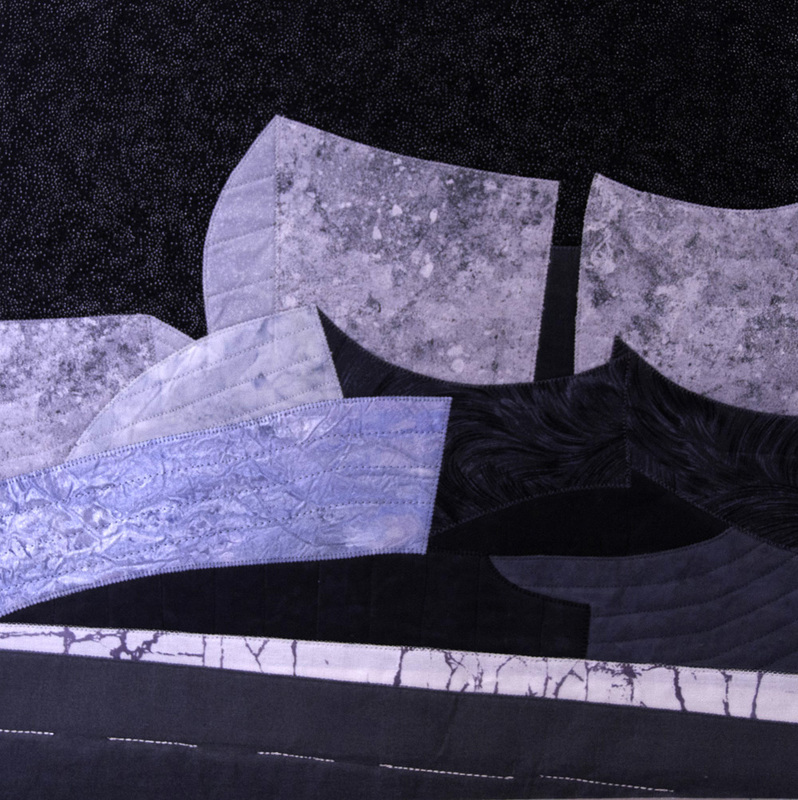 The quilt is made using raw edge fusible applique. 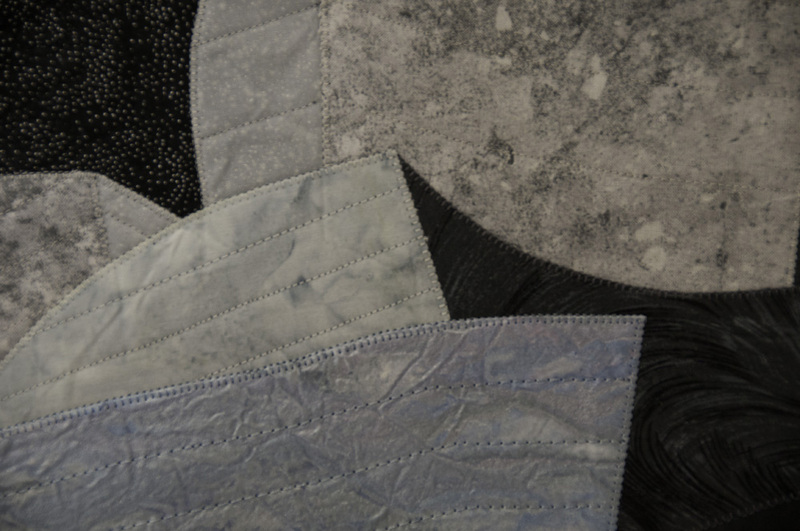 The fabrics include commercial prints and batiks, plus an unusual very stiffly painted metallic piece that I found at a quilt show. (I did not retain the information about the maker.) My goal was to capture the interplay of sunlight against the steel panels which cover the iconic building. Susan, your subject was great and your interpretation of the shapes really interesting : the lines are pure and I love your colours ! congratulations ! What a wonderful interpretation. Well done! A wonderful piece of work, you have certainly put a lot of effort into its’ production, well done. Wow, what a brilliant interpretation, the shapes lend themselves to this treatment, great! What a Christmas card can do! Lovely shapes. Good use of the fabrics to create a steel look.